“First impressions count”. We hear that phrase used time and time again, in various everyday situations. But it’s true — they do indeed count. No matter how good an app you think you have, if you screw up at the first hurdle, your users won’t take the time to explore further. This post highlights just a few of the things to look out for, when designing your app start-up, onboarding, and “Welcome” / “Home” screens. An example of loading screen, often seen during app start-up. Us Brits, are renowned for being a patient bunch, but our “buffer face” (as Kevin Bacon put it), will rapidly morph into a, “this is a useless, piece of @#$!!  !” face, if the app doesn’t load as quickly as we would like it to. Remember, your app will be used out and about, on the go, in areas where Wi-Fi connectivity comes at a premium. If your app is perceived to be slow, over 3G or 4G connectivity, you’re in real danger of losing your audience. Speaking from previous experience, app start-up is where you really need your app to shine. If it’s deemed to be slow here, chances are, your users will assume that the rest of your app, is going to be just as slow. You then face the risk of users exiting the app, or worse-still, uninstalling it altogether. The same applies to apps that persist in crashing on start-up. We’re often willing to forgive an app, if it crashes on first-time start-up following a new install, but if it crashes any more than that, we’re less likely to be so tolerant. Best of all, Crashlytics is free for most, and extremely lightweight — so no excuses! I’m all for user onboarding, but only where deemed appropriate, in the sense that it adds value to the user experience. Even then, poorly-designed onboarding, which hasn’t been properly thought through, or undergone user testing, can be more detrimental and damaging to the app, than not showing it at all. For example, if you insist on providing an “app intro”, “tutorial” or “new features” tour, at the bare minimum, provide a clear, visual cue to allow the user to skip the tour, so that they can delve straight into using the app. Don’t force the user to view all steps of the tour, first. Not only is it annoying, but it also can lead to many users opting to uninstall the app, before they’ve even had chance to explore it. Discoverability plays a huge part of the enjoyment factor. Locating a cool feature, or an impressive piece of functionality, unaided, instils a sense of achievement, and inspires you to want to continue using the app, to unveil more new and exciting stuff. The first step of onboarding, on the DG SS15 iPhone app. Also, be very careful, with the use of language, or prompts, throughout your onboarding. Take Dolce & Gabbana’s Spring / Summer 2015 iPhone app, for example. Upon first-time start-up, you’re presented with a tour, illustrating how to interact with the app. The very first screen on the walkthrough, features a cropped shot of the app, and states, “SCROLL DOWN TO VIEW THE CONTENTS”. This prompt is supported by an upward and downward facing arrow. Common-sense suggests you can scroll up and down on that screen of the walkthrough, as per the prompt. Try it, and you’ll find that nothing happens. Why? Because you’re in the walkthrough, and not the “main body” of the app, you can only swipe left and right, across the viewport, to cycle through the various steps of the walkthrough. Of the 5 UX Designers, I asked to test the app, all but one, tried to swipe up and down, as per the prompt. It wasn't until a few seconds later, when they eventually noticed the progress indicator, that the penny dropped, so to speak. The next step of the walkthrough is equally as concerning. The prompt here, asks the user to, “TAP TO OPEN THE MENU”. An upward-facing arrow features in support, pointing towards a “hamburger” menu icon, again, on a cropped shot of the app. The remainder of the screen is blurred out, further emphasising the icon. Tap it — and again, no response. An animated / video-based walkthrough may have been a more apt choice here, although had user testing been carried out (which I think it’s safe to assume, hasn't in this instance), this usability issue could have been detected and resolved, before the app was subsequently released to the public. Apps that present options only to “Sign Up” or “Log In” are also off-putting. Users should be given the choice to browse the app first, before making an informed decision as to whether or not they want to then register an account. The “Home” screen as featured on JackThreads’ iPhone app. 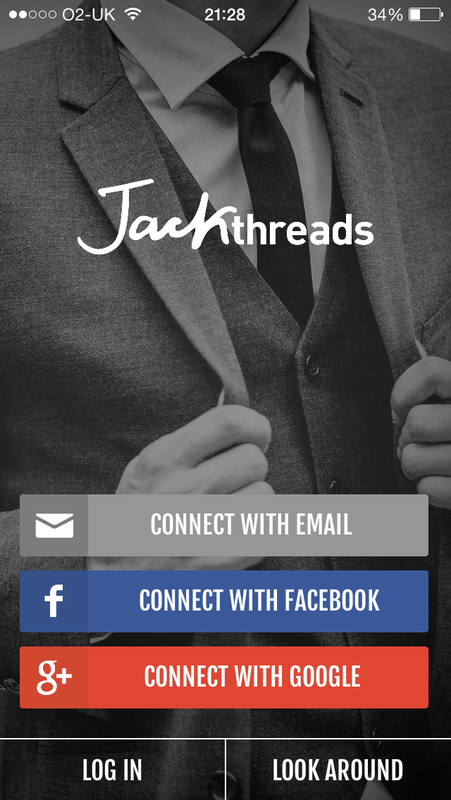 As if things couldn't get much worse, there are apps, who encourage sign up through social networks (such as Facebook, Twitter and Google+), as is the case when you first start up JackThreads’ iPhone app. Yes, JackThreads are a members-only, shopping community, but what if you want to see what the community is all about, before handing over your personal details? That said, JackThreads do also offer options to sign up by e-mail and “Look Around” — the latter allowing you to see what the app is all about before making a conscious decision to sign up. Men’s fashion retailer, Frank and Oak also have an iPhone app, which again encourages the user to “Connect with Facebook”, as their primary call-to-action. Unlike JackThreads, they do however provide a link to “Skip and start shopping”, albeit the link is tiny — 6px font size, at best. It’s also docked right to the bottom of the viewport, with very little contrast, between the font colour and the underlying background image, thereby making it extremely difficult to see and tap. Even after viewing the walkthrough on Flickr’s iPhone app, you’re still forced to sign in with a Yahoo account to use the app. If like me, you don’t have one, you can either then opt to “Create Account”, or alternatively, tap the button that reads, “Looking for Facebook or Google sign-in?” Tap this option, and you’re redirected to a Yahoo Help page embedded into the app, which offers unclear and unhelpful advice, on how to sign in to Flickr using a Facebook or Google ID. After reading through all this and logging into my Google account, I was then told that I still needed to create a Yahoo account, at which point I promptly went ahead and uninstalled Flickr. You can browse Flickr’s mSite, without needing to sign in, so why force users to, in the app? As an app user, this is a real bug bear of mine. I hate “Rate the App” prompts with a passion — even more so, when they’re served up on app start-up after just one, or even two, times of using the app previously. There’s a time and a place to present the popup to the user, and it requires careful thought — a good example of a multi-variant test to run. There are other, more subtle ways to allow the user to rate the app, without coming across as being too forceful, in your approach. One such initiative, would be to hide it in your app’s overflow menu, or within the “Help” / “App Settings” area. This way, the user can discover the facility, before choosing if and how to act upon it. Remember, the majority of reviews customers leave are often negative, so don’t make it easy for the user to do so. The “Home” screen, as featured on Oasis’ iPhone app. The iPhone apps belonging to fashion retailer, Oasis, and mobile video search engine, Tubidy, both present the user with a blank screen, following first-time, app start-up. The tab bar and header are both present; however, the main pane of the app, features little or no content — not ideal for somebody new to the app. 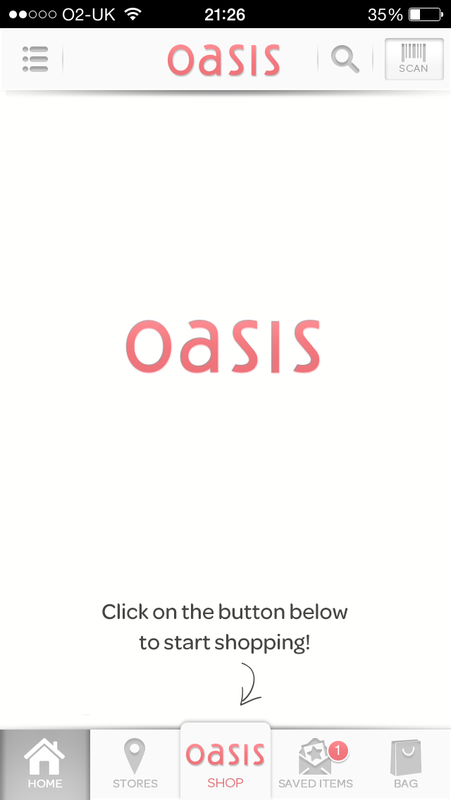 In the case of Oasis, in the middle of their “Home” screen, the user is presented with the Oasis logo and a onboarding message, asking them to click the “Shop” button in the tab bar to start shopping. This seems pointless (and technically, it should be “tap” not “click”). It would make more sense to present the user with the screen they can start shopping from, from the offset. Given that this is a retail app, the primary reason, most users will have downloaded the app, is to shop. The approach adopted by Oasis, acts as a barrier to achieving this objective. With Tubidy’s app, there is no clear call-to-action, on the “Home” screen. There’s a search box in the app’s header, and a tab bar docked to the bottom of the viewport, but there’s nothing in-between, aside from a feint Tubidy logo. At the bare minimum, you’d expect some featured videos to be shown. Nada. I think it’s fair to assume that most of National Rail’s users will not know what a “database migration” is. The use of technical jargon like this, is confusing and far from user-friendly. Although it’s unlikely to stop people from using the app, it’s not ideal and an oversight on National Rail’s part. Rather than showing this, they could have replaced the default, iOS “daisy loader”, with a train animation transitioning into and out of view, from the edge of the viewport, and maybe a “Did You Know?”-style message in support — or a “Hint and Tips”-type callout. Any way in which you can distract the user from the fact that the app is taking a while to start-up, can only be a good thing. 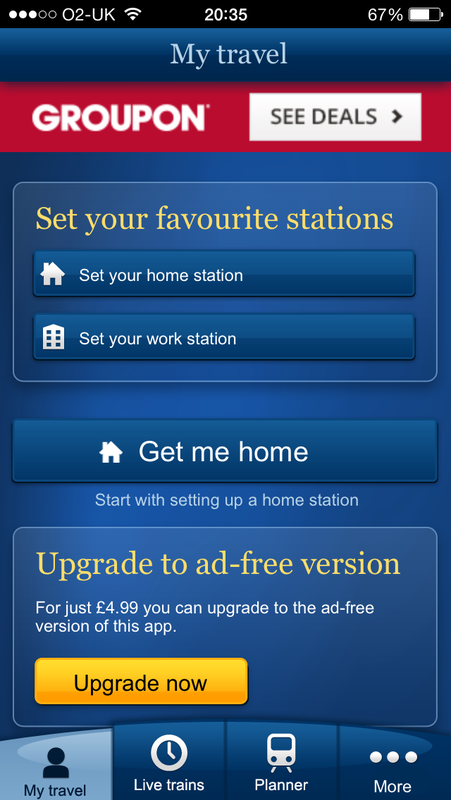 The “Home” screen, as featured on National Rail’s iPhone app. Sticking with National Rail, once I did eventually make it past the “Splash” screen, I was horrified by what I was presented with on the resulting “Home” screen. At the bare minimum, I was expecting to find a facility allowing me to specify where I was travelling from, and to, so that I could look at train times and resulting ticket prices. Instead, I was presented with a large, red Groupon banner, which immediately took my attention away from everything else on the screen. A little further down the screen, was a “upsell” area (for the lack of a better description), encouraging me to upgrade to the “ad-free version” of the app, at a cost of £4.99, followed up with a large, orangey-yellow, “Upgrade now” call-to-action. £4.99 to upgrade to an ad-free version?! You must be having a laugh!!! 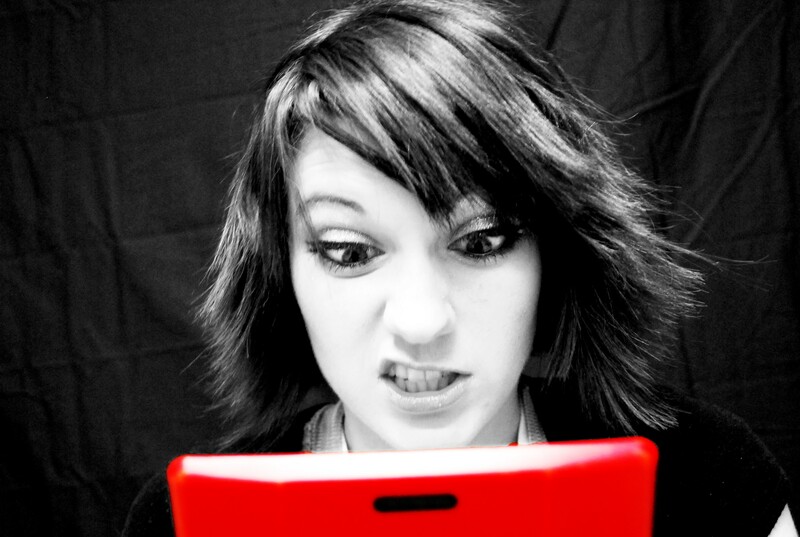 Don’t overlook the first interactions and engagement the user will have with your app. Just like with a homepage redesign for a website, this is the point at which you have to work the hardest to convince your new app users, to stay put, and further delve into the deeper realms of your app. Even the smallest frustration at this point, could be enough for the user to exit the app, and worse-still, uninstall it for good. Learn from mistakes made by apps like those listed above, but more than anything, make sure you involve your target audience, in usability testing before you release your app for all to see, as this is the point at which you’ll learn whether or not, your users are likely to proceed beyond app start-up / the first screen. Even if it turns out that they won’t, at least you then have an opportunity to go back to the drawing board, and try again, until you get a more positive reaction from your audience. It’s much easier to make amends now, rather than “on the fly”, having released an app to the public, only for it to be receiving lots of negative reviews, for reasons similar to those listed above. Never release something for the sake of doing so. Make sure it’s right for your users, from the word “go”. Originally written and published to www.uxchap.com on March 24th 2015, by Joe Pendlebury.